HARRY S. TRUMAN was born on May 8, 1884 in Lamar, Missouri, the oldest of the three children of John Anderson and Martha Ellen Young. 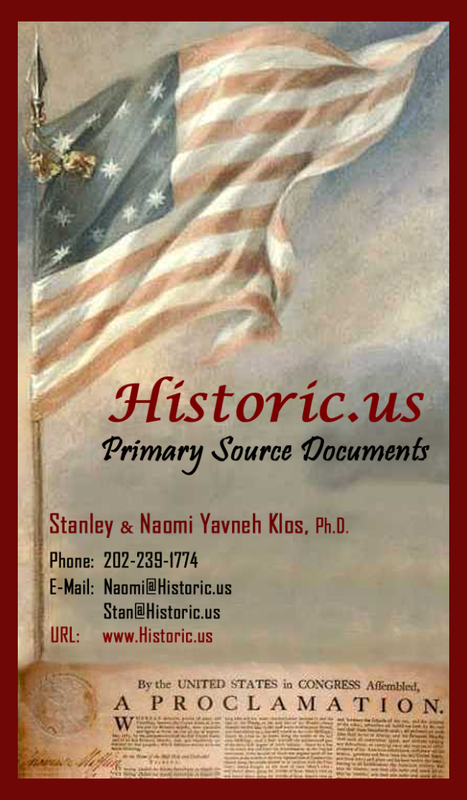 He was not given a middle name, just the initial “S”, reflecting his parents unwillingness to choose between his grandfathers – Anderson Shippe Truman and Solomon Young. In 1890, at the age of 6, the Trumans moved to Independence, Missouri. Young Truman attended the Presbyterian Church Sunday school, where he met five-year-old Elizabeth Virginia (“Bess”) Wallace, who would later become his wife. He did not begin attending the local school until he was eight and by that time he was wearing extremely thick glasses to correct his nearsightedness. Because he could not join in many of the boyhood activities due to his poor eyesight, he turned to the piano and books for entertainment. He got up each day at 5 to practice the piano and he took piano lessons twice a week until he was 15. He read four or five books each week, being especially interested in the history of great military battles and the biographies of world leaders. 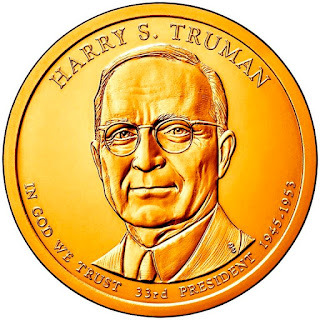 Truman graduated from high school in 1901 and because of his father’s financial difficulties, college was not an option, and an appointment to the U.S. Military Academy at West Point was eliminated because of his eyesight. He started working for the Santa Fe Railroad as a timekeeper for $35 a month. He then moved to Kansas City, where he accepted employment as a mail clerk for the Kansas City Star and joined the Missouri National Guard. A while later, he accepted a position as a clerk for the National Bank of Commerce and then as a bookkeeper for the Union National Bank, adding more to his experiences than to his finances or sense of accomplishment. In 1906, at the age of 22, he was called home to help his father manage the Young farm in Grandview after his maternal grandfather’s death. He spent the next 10 years as a successful farmer, in the “golden age” of American agriculture. He became more confident and gregarious than he had ever been before, doing the work into which he had been born. He joined Mike Pendergast’s Kansas City Tenth Ward Democratic Club and the Masons. He began to actively participate in politics, and on his father’s death in 1914, he succeeded him as road overseer, and in 1915 he became the Grandview postmaster. In 1917, just before the United States entered World War I, he enlisted in the U.S. Army, training at Camp Doniphan in Oklahoma. He returned to Missouri and was elected first lieutenant by the men of Missouri’s Second Field Artillery. Truman was commissioned a captain and on March 30, 1918, he sailed for France in command of Battery D, the “Dizzy D”, of the 129th Field Artillery, 35th Division, American Expeditionary Force, taming his unit. They distinguished themselves in the battles of Saint-Mihiel and Argonne, and Truman never lost a man. He discovered he had talents as a leader and gained the esteem and affection of his men. In April 1919, he returned home a major and a hero, and of June 28th he married Bess Wallace, his childhood sweetheart. The couple had one daughter, Mary Margaret Truman who was born in 1924. In the fall of 1919 he established a men’s clothing store in Kansas City with a partner, Eddie Jacobson, an army buddy from training camp. The Dizzy D veterans were big customers and the store did a booming business after the war. But when the postwar depression hit, farm prices fell sharply and the business failed, finally closing in 1922. Left with heavy debts, Truman refused to declare bankruptcy and eventually repaid his creditors. Encouraged by Jim Pendergast, who was Mike’s son and also an army friend, Truman turned to politics. He entered a four-way Democratic primary for an eastern Jackson County judgeship and based on his war record and his Missouri background, he won the primary and the general election. He was sworn into his first public office in January 1923. He failed to win reelection in 1924 and spent the next two years selling automotive club memberships and entered into a banking venture. He was elected the presiding judge of the court two years later and reelected to that post in 1930. These positions were administrative rather than judicial and they enabled Truman to earn the respect of his constituents by being an honest official, firing any man who failed to do an honest job. In 1929, Mike Pendergast had died and his two sons, Jim and Tom, replaced him as head of the Kansas City Democratic Political machine. By 1934, the Pendergast machine was a tool for gangsters promoting vice rings, bootlegging, bribes, gambling and murder. Truman was eager to move higher in politics, and when Tom Pendergast approached him in 1934 to run for the U.S. Senate, he accepted. 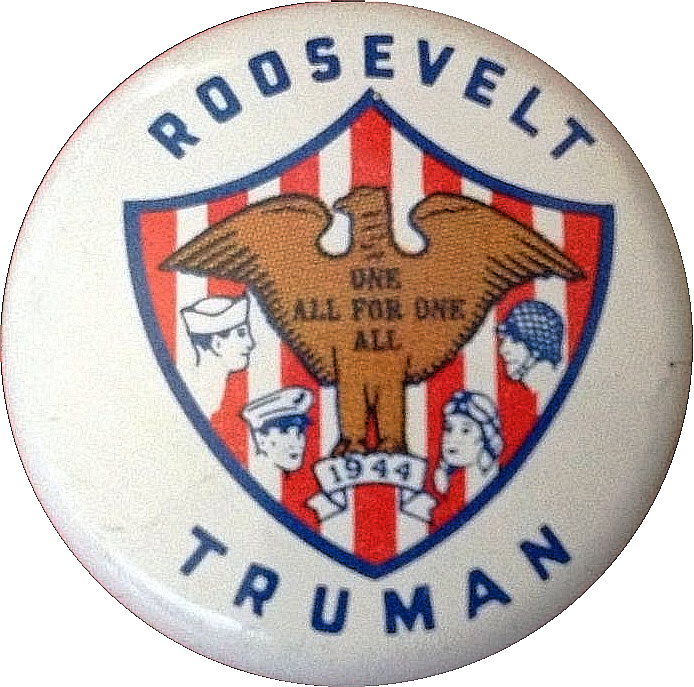 Truman campaigned vigorously, capitalizing on the popularity of President Roosevelt and his own political record. Truman soundly defeated his Republican opponent, but not without help from the Pendergast machine. Truman was sworn in as the junior senator from Missouri on January 3, 1935. He arrived in Washington facing the resentment of fellow Senators regarding his association with the Pendergast machine. The White House was already investigating the Pendergasts and Roosevelt felt Truman would probably be implicated. When the Pendergast investigation ended, it revealed widespread corruption and brutality but it failed to implicate Truman in a single act of wrongdoing. Pendergast was sent to prison for income tax evasion and Truman was criticized for his ties with the organization. Despite his Pendergast ties, Truman won an unexpected reelection in 1940, and received a standing ovation when he returned to the Senate. He was named the head of an investigation committee into the waste and confusion in the defense program and The Truman Committee put him on the national stage. Roosevelt’s health was a great concern to party leaders who assumed he would fun for a fourth term. They were eager to find a vice president who would be more appealing to mainstream voters and who would not be as liberal as the current vice president Henry A. Wallace, who offended many conservative leaders of the Democratic Party. Roosevelt persuaded Truman to run with him and Truman defeated Wallace for the nomination on the second ballot at the Democratic National Convention. The ticket was overwhelmingly elected and Truman took the oath of office as vice president on January 20, 1945. 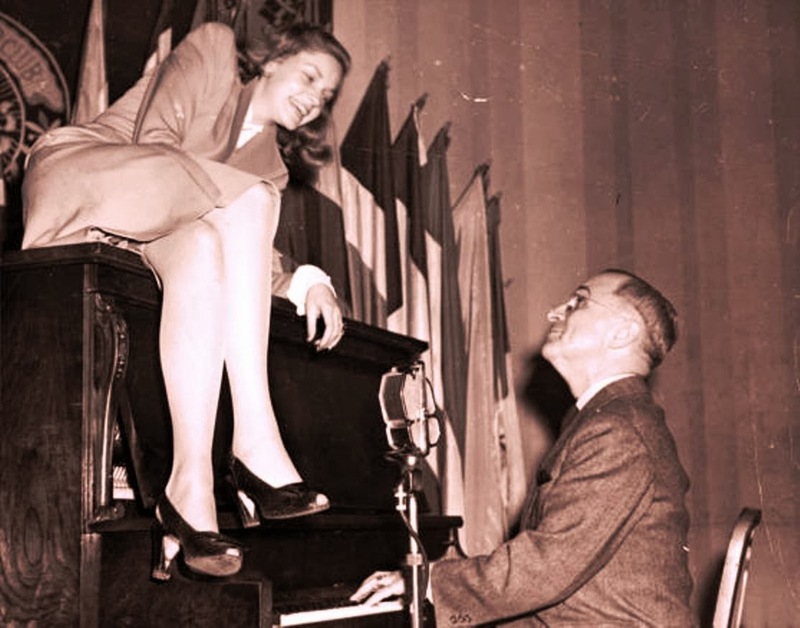 Vice President Harry S. Truman plays the piano with Actress Lauren Bacall atop at the National Press Club Canteen. 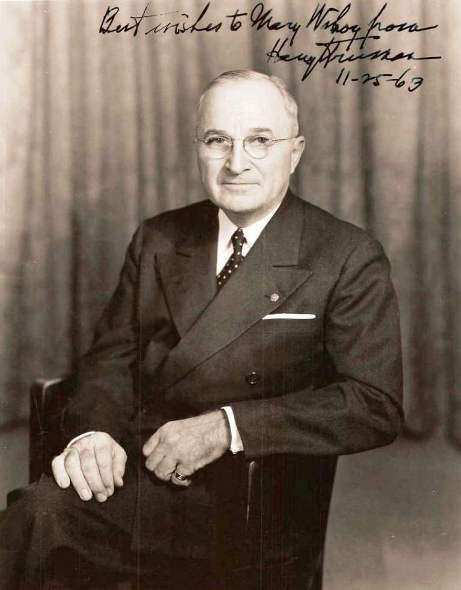 Truman faced the awesome task of President by dealing with the problems as they emerged, his first month largely devoted to briefings by Roosevelt’s aides. When victory in Europe seemed certain, he insisted on the unconditional German surrender. On May 8, 1945, his 61st birthday, he proclaimed Victory-In-Europe Day (V-E Day). He continued to carry out Roosevelt’s policies with the establishment of the United Nations and attended the founding conference in late April. When Japan vowed to continue fighting after Germany surrendered, he authorized the atomic bombing of Hiroshima on August 6, 1945 and Nagasaki on August 8, 1945, bringing the war to an end quickly. Truman was noted for his candor and wit and he originated the line, “The buck stops here.” He was elected to a second term contrary to the projections of newspapers and polltakers. They had almost unanimously predicted his defeat. 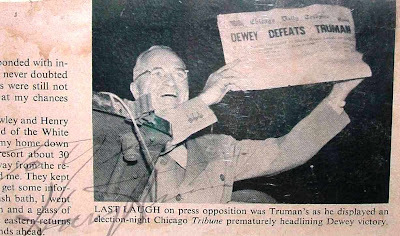 Popular vote: Truman, 24,105,812; Governor Thomas E. Dewey of New York, the Republican candidate, 21,970,065; Governor J. Strom Thurmond of South Carolina running on the States Rights (Dixiecrat) ticket, 1,169,021; and Henry A. Wallace of New York, the Progressive party candidate, 1,157,172. Electoral vote: Truman, 303; Dewey, 189; Thurmond, 39. 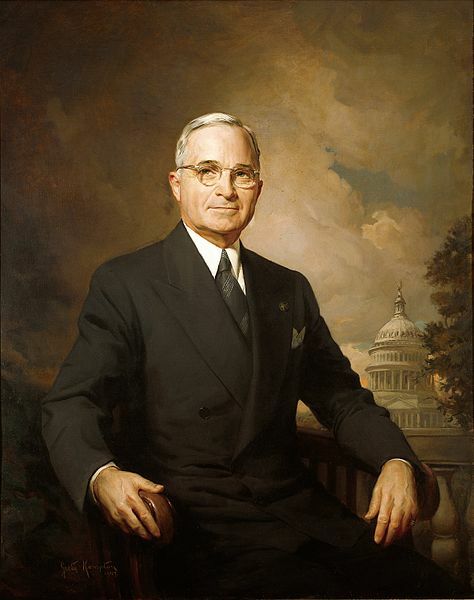 Truman’s second term saw him strengthening his liberal “Fair Deal” program. He stood firm against the Soviets and he carried out a policy of Communist “containment” and the support for free peoples in Greece, Turkey, West Berlin and South Korea. He ordered desegregation of the armed forces, established NATO and dismissed the very popular General Douglas MacArthur for insubordination in Korea. His “Fair Deal” was obstructed by a conservative, largely Republican, congress. His predisposition toward callous expression when critics angered him increased his difficulties, as did inflation and charges of corruption. In March 1952, Truman declared he would not seek reelection. When the Republican, Dwight D. Eisenhower was inaugurated, Truman retired to his home in Independence, Missouri. He was 67 years old. He remained active in politics, loyally supporting his party’s nominees and campaigned throughout the country for Democrats seeking state and federal offices. He published his memoirs in 1955 and 1956, reflecting his strong interest in history and a desire to present his own view of his years in government. In 1957 he dedicated the Truman Library in Independence. 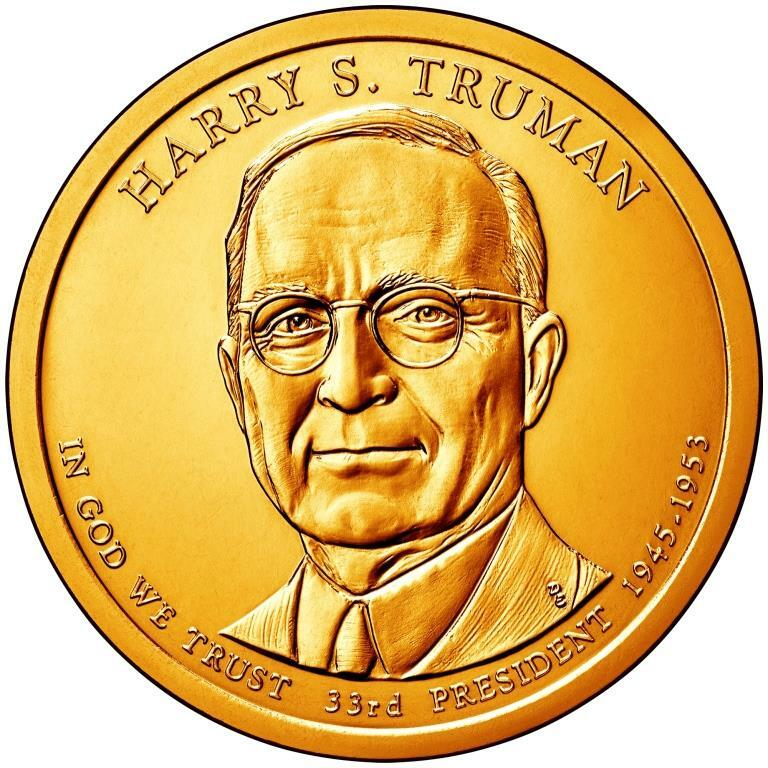 Truman died on December 26, 1972 in Kansas City, Missouri.